“Well, that was unique!” was the reaction of my theater novice brother about the unusual but very fun production of The American Revolution by Theater Unspeakable. Difficult to explain, but a hoot to experience, Theater Unspeakable is a very physical theater company based in Chicago but tours extensively to share their creative works around the U.S. The American Revolution is an original production, a wild summary of the American fight for independence. Currently playing at the Greenhouse Theater Center, 2257 N Lincoln Avenue, Theater Unspeakable has a limited engagement October 17 through November 11. Following its Chicago run, The American Revolution will soon play in Washington and California. Combining tongue-in-cheek humor and quick pacing with amazing body language, The American Revolution brings to life George and Martha Washington, King George III, Sam Adams, Paul Revere, John and Abigail Adams, Thomas Paine, and Thomas Jefferson. 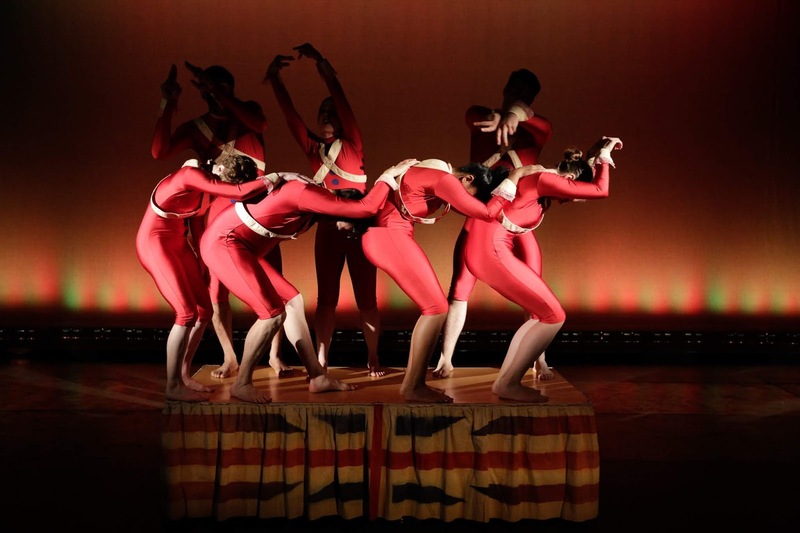 The seven performers create a theatrical game like Twister with impressive acrobatics. One of my favorite bits was whenever King George III was portrayed, one of the actresses was placed behind him as his legs, creating a hilarious visual effect as he childishly waved “his” legs in the air. “I liked their retreat,” observed my sister after the show. When ascending a hill to battle, the actors had their fingers act as small legs rushing the hill, then “retreating” upon command. Funny stuff. “In this 50-minute play, seven actors, all performing two feet off the ground, share 21 square feet of space to recreate the entire American fight for independence from Lexington to Yorktown. 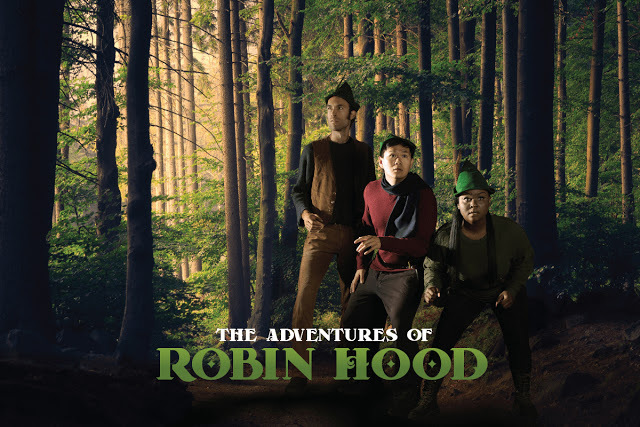 Using only the actors’ bodies and voices, the show evokes an epic time-period in American history,” according to their press release. (“How did they not fall off that platform?” asked my mesmerized brother.) We asked how long they rehearsed and were amazed it was only three weeks. Just the variety of sound effects alone would be a challenge to coordinate. This production was originally devised by the following members of Theater Unspeakable: Brittany Anderson, Parker Arnold, Zachary Baker-Salmon, Marc Frost, Patrice Foster, Jeffery Freelon, Kyle Geissler, Jason Hammond, Trey Hobbs, Kathleen Hoil, Quenna Lené, Katie Mancuso, Aaron Rustebakke, Lyn Scott, Vanessa Valliere, Ryan Westwood and Thomas Wynne. The production stars Devin Sanclemente who is great as King George, Sonja Lynn Mata (Sam Adams), Alex Small (John Adams), Caroline M. Watson (Governor Dinwiddie), Lexi DeSollar (Abigail Adams), Jeffery Owen Freelon, Jr. as an awesome George Washington, Carolyn Moore (Martha Washington), Jamia Taylor, and Renata Camara Loader. Highlights include the Boston Tea Party, the re-enactment of Washington crossing the Delaware, and the rendition of “My Country, Tis of Thee” while mimicking an American flag. If all portrayals of History had been more fun like this, I would have paid more attention in Social Studies at school. The American Revolution is a perfect family show, so we want families to enjoy it together! Theater Unspeakable is now offering a family discount. Get 4 tickets for only $50. Have more than 4 people in the family? No worries! It's only $12.50 for each additional family member. 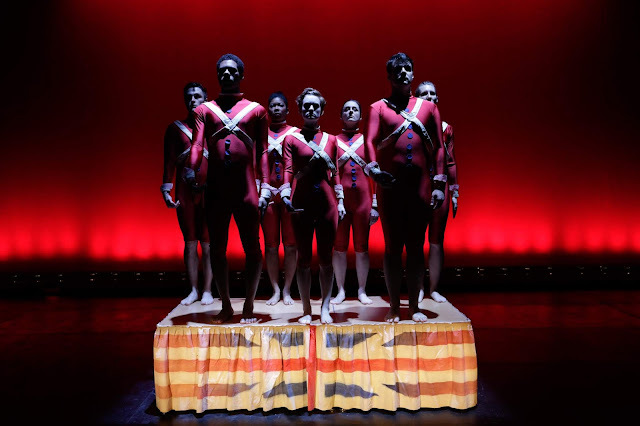 Catch Theater Unspeakable's American Revolution now until 11/11/18. The crazy physical comedy that results from Theater Unspeakable's unique platform performances has long been a favorite of ours here at ChiIL Mama. You have to see it to believe it, and with their acclaimed version of THE AMERICAN REVOLUTION, you just might learn a bit of contorted history too. Check it out! Theater Unspeakable, a devised, physical theater company based in Chicago that has received tremendous critical acclaim across the U.S., presents THE AMERICAN REVOLUTION, a whirlwind re-telling of the American fight for independence at the Greenhouse Theater Center, 2257 N Lincoln Avenue, for a limited engagement October 17 through November 11, with a press opening at 2 p.m. on October 20. Prior to its Chicago run, THE AMERICAN REVOLUTION will play in Washington D.C at the Kennedy Center, and following Chicago in Washington at the Edmonds Center for the Arts and California at the Performing Arts Center San Luis Obispo. Combining tongue-in-cheek humor with a dash of derring-do, THE AMERICAN REVOLUTION brings to life George and Martha Washington, King George III, Sam Adams, Paul Revere, John and Abigail Adams, Thomas Paine, and Thomas Jefferson, amongst others, to bring the audience the original story of the greatest democratic experiment in world history. The physical theater practiced by the company draws upon the heavy influence of Theater Unspeakable Founder and Director Marc Frost’s, time at the London International School of Performing Arts (LISPA). This two-year theater program based on the teachings of Jacques Lecoq exposed him to many different styles of theater. Since returning and founding the company, Marc has set a goal for himself and his collaborators to continue experimenting with these styles until they have broken ground on new forms of their own. From October 17 – November 11, THE AMERICAN REVOLUTION will run Wednesdays and Thursdays at 10 a.m. and 12:30 p.m., Saturdays at 11 a.m. and 2 p.m., and Sundays at 11 a.m. The running time is 50 minutes with no intermission. There will be a Q&A with the artists immediately following each performance. Ticket prices are $30 or $20 for students, industry, seniors, and military and can be purchased at https://www.greenhousetheater.org/theamericanrevolution-tickets. Founded by Marc Frost in 2010, the Chicago-based Theater Unspeakable draws upon the heavy influence of Jacques Lecoq and Marc’s two years spent at the London International School of Performing Arts (LISPA). The American Revolution is Theater Unspeakable’s third production, following Superman 2050 and Murder on the Midwest Express. Their work has been presented at the Kennedy Center in Washington, DC, The Chicago Humanities Festival, and at Lincoln Center Education in New York. They continue to tour nationally. Adventure Stage Chicago and Theater Unspeakable; a fantastic duo. We’re joining forces to make bringing your family to the theater easier. Use the code: Revolution to get $5 off tickets to any Adventure Stage or Theater Unspeakable production. Check out what ASC is offering this season!